I like all those things, too, especially the first couple. And since listing things you like is cheering, I decided to fill out my own list of favorite things. One of them is the photograph at the head of this post. 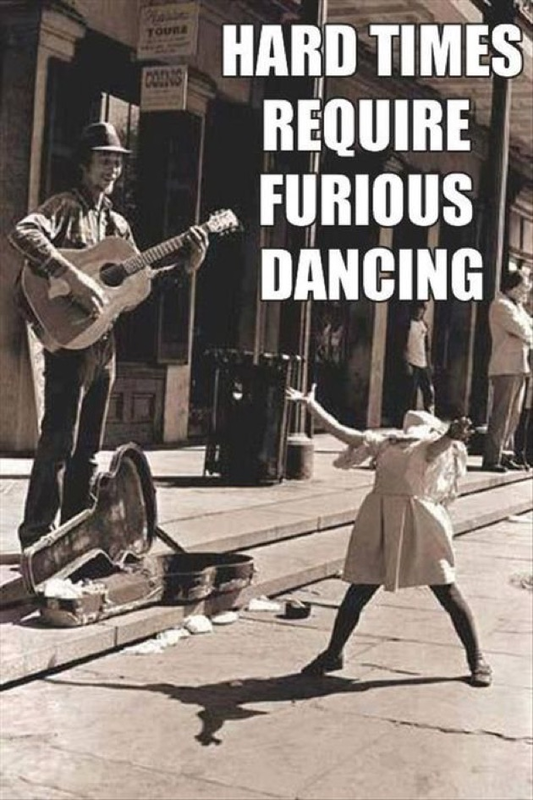 Yes, hard times do require furious dancing, and these times we are in certainly seem to qualify. My other special likes: happy songs, having plenty of time to think things over, and vintage cookbooks. Last week I was treated to exactly the type of happy song I love. My co-worker, Breanne, sent me a link to a fine performance of “If My Nose Was Running Money [I’d Blow It All on You].” Breanne said that she first heard that song at her grandparents’ 50th wedding anniversary, and since that made it an automatic family tradition, she sang it at her own wedding reception. Breanne was inspired to share the nose song because I had sent her a link to one of my favorite music videos, and she was so pleased with it that she wanted to give me a song in return. The video is Finnish band Steve ′n′ Seagulls covering AC/DC’s “Thunderstruck.” You would swear those Finnish boys were from right here in North Carolina., especially when you see the guy driving up to the band’s back yard gig on a riding lawn mower while playing the accordion. It is not only a masterful version of the song, it is also visually delightful. Goodness knows we need all the delight we can get. To put it boldly, contemplation is the only ultimate answer to the unreal and insane world that our financial systems and our advertising culture and our chaotic and unexamined emotions encourage us to inhabit. To learn contemplative practice is to learn what we need so as to live truthfully and honestly and lovingly. Obviously, if I had all the time I really need to meditate (or sit around with my mouth hanging open—same thing), I would be more honest and loving. It’s not my fault that I’m not. I nearly laughed out loud and spoiled everyone else’s contemplation, because evidently that text is the bedrock, so to speak, of my mother’s spirituality. She enjoys sleeping, and she’s good at it. She arises from sleep reluctantly, and clings to it by recounting her dreams for us (especially the most bizarre ones). Probably I inherited this from her, because even though I am more of a morning person than she is, I love sleep and like to tell about my dreams, too. Finally, there are few things that make me happier than old cookbooks, especially from small Southern churches or country towns. I love the way they withhold crucial information: the size of the pan needed, the temperature of the oven, or a measurable amount of certain ingredients. And the names of the dishes! Coca-Cola Salad, Granny Bell’s Chicken Slick, Fancy Franks, and (this is true) Potatoes au Rotten. That one’s a classic, because although it’s a version of scalloped potatoes with cheese, it also calls for “a special barbecue sauce that I concoct myself.” Oh, I see. There’s no possible way anyone else could use that recipe to make Potatoes au Rotten. Thanks for submitting it to Maury O’Dell’s Ask-Your-Neighbor Cookbook, Rufus! For you see, that particular recipe came from the kitchen of Rufus L. Edmisten, former Attorney General and later Secretary of State of North Carolina. Her recipe began with softening biscuits in hot water, then adding cornmeal, salt, and milk. Without getting up and looking, I think that was it. About a year ago I found a recipe in an old cookbook at someone else’s house and jotted it down hastily on a piece of note paper. I gave it the name, “Cornbread Like Grandma’s?” but forgot to write down the name of the cookbook. Anyway, the recipe began with biscuits, which was what gave me hope that it might be the one. I have made it twice now, with slight variations, and it is very close to the cornbread I remember. If I play with the type of oil I use, I may finally have it. Make the stiff batter into round balls—rather small ones—and flatten into cakes about 1/2-inch thick. Have bacon grease or lard deep enough in the pan to run back and forth—but not too deep. Have the pan medium hot. When the cakes are brown (it will not take long), turn. They should rise and be light and happy. Brings back fun memories. My grandmother had a recipe that called for a $0.49 Hershey bar. I think she meant the extra big bar but it’s funny to look at and ponder what $0.49 meant back then.